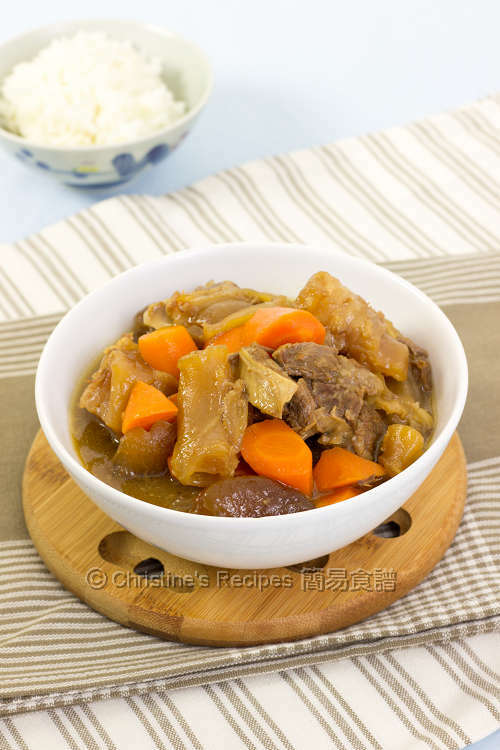 If you are too accustomed to the traditional beef brisket / tendon in chu-hou paste (柱侯醬) like me, and can’t think of another alternative way of cooking, this recipe is for you. When one of my fans posted a question asking for a recipe of tendon, instantly I recalled the tasty tendon and brisket dish that my mother-in-law cooked for me a while back in Hong Kong. I loved at first bite literally. This dish goes really well with steamed rice or noodles. 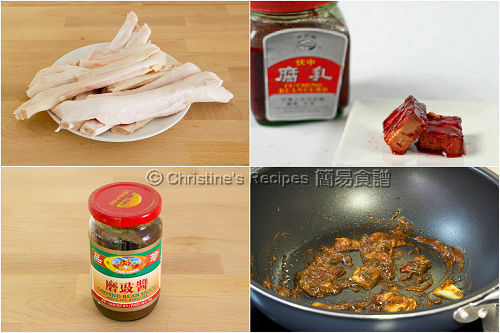 To make this dish, you need these special ingredients: beef tendon, available at Asian butchers, red fermented beancurd (南乳) and ground bean sauce (磨豉醬), available at Asian grocers. Or you might get it from Amazon. Blanch beef brisket and tendon in boiling water for about 3 minutes to remove the blood and impurities. (Remark: blanch in batches if your wok or pot is not large enough.) Rinse and drain well. Heat oil in a heavy-based pot over medium heat. Sauté ginger, red fermented beancurd and ground bean sauce. Add the brisket and tendon and stir fry for about 5 minutes. Add water and rock sugar. Bring it to a boil. Cover and reduce the heat to simmer for about 3 hours, until the brisket and tendon turn soft. Add boiling water if the water lever is too low. The water should be enough to cover the tendon. Add carrot or radish. Continue to cook for another 20 minutes. Stir in the sauce and cook to your preferred consistency. It takes quite a while to cook the beef tendon until softened. You might like to use the residue heat in the pot to save energy. Cover and cook for half an hour. Turn off the heat with cover on and let the residue heat inside continue the cooking for about 20 minutes. Repeat this step until the tendon is softened. Along the way of cooking, the water should be enough to cover the tendon. Otherwise, it’d hardly be softened. Or stir occasionally and help heat the tendon evenly. If using a pressure cooker, cooking time can be cut by half at least. Red fermented beancurd and ground bean sauce are available at Asian grocers. Can use one daikon, about 500 grams or whatever amount you like. Just a few thinly sliced ginger would be enough. if i don't like tendon, can i replace 500g of that with more beef brisket? Yes, you can for sure. Ur beautiful clicks with well explained recipes are the facts that drawns me into ur amazing blog. This recipe is very new to me. I love beef and this looks yumm. Oh this is one of my big favourites! I love the version that uses cloves and star anise, but this one sounds great too. Must give this s try very soon, we ate alot of these during out trip to HK earlier in the yer. Thanks for sharing! Looks super tasty! I love beef tendon! I had just made tendon soup last week, just simple soup. Love the way you cook it. Looks very delicious. Thanks very much for sharing. Looks so delicious! Really love those beef tendons! Do you have a recipe for roast chicken using ground bean sauce? Also what other recipes uses ground bean sauce? Sorry, don't have the recipe of roast chicken using ground bean sauce. But I've got a number of recipes used this delicious sauce posted here. There's a search box at the top of this blog. Simply key in "ground bean sauce", you'll get what you want. This sounds very tasty! What an awesome recipe! Thank you so much for what you do! I only just discovered your cookbook and website... I am American-born Chinese and it has always pained me that I couldn't make my mother's recipes on my own. Thank you. Do you ever put sand ginger in your beef stew? No, I didn't try using sand ginger in cooking beef stew. Hi Christine, I've just discovered your website and think it's awesome. I've been trying to look for some traditional Chinese recipes to cook for my husband and son as my skills are very limited. Thanks to your website, I've printed a few off that I'm going to try. This is the first dish I made. At first I was a little turned off because of the strong beancurd smell but after one taste, I was hooked. This will be a family regular now. Thank you so much. Thanks for trying my recipes. The red fermented beancurd is quite common in cooking Chinese stew. I know not many people like the beancurd (the appearance and smell), yet surprised to find out that many people who tried the dishes cooked with beancurd are quickly hooked. My daughter is one of them. Glad that you liked this dish. Welcome you on board ! Hi Christian, can this recipe use on ox tail instead of beef tender & brisket? Think that it will work for both ox tail and brisket too. 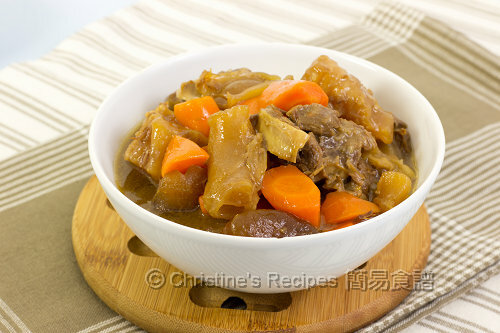 A great idea to use pressure cooker to make this slow-cooked stew in order to shorten the cooking time. Glad that you've got the 南乳 & 磨豉醬 from your friend. Happy cooking and eating ! Do I simmer with the lid on or off? Simmer with the lid on. It helps to soften your beef tendon more quickly. if not have ground bean sauce can use that chu-hou paste? Chu-hou paste is good. I have a beef-brisket recipe yielded chu-hou paste.